This is a Gemei G9T, a 9.7″ Tablet running Android 4.0. [Carnivore] shows us how to modify it to use inductive charging. The inductive charging hardware is taken from a Palm device (this uses the Touchstone charging hardware seen in several other hacks). It’s easy to interface with the tablet’s electronics, but physically placing the coil and magnets is another story. The video after the break gives you a full walk-through of the process. He starts by removing the screws and prying the case off of the tablet. From there [Carnivore] shows how to carefully remove the coil, circuit board, shielding, and magnets from a Palm back plate. 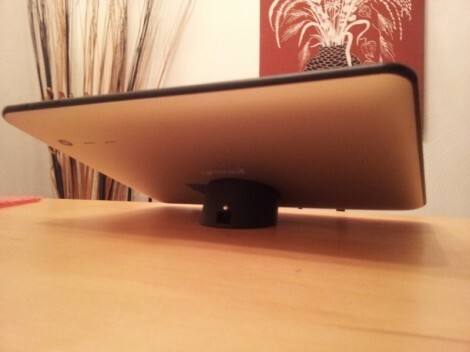 The magnets are the first to be positioned on the tablet’s back plate. The metal is too thick for them to hold well so he uses a Dremel to grind away just enough material for a strong connection. Unfortunately the metal will shield the magnetic fields the coil needs to work so he cuts a hole in the case the same size as that coil. The area is covered in liquid electrical tape to prevent shorts, and everything is taped in place. Two jumper wires connected from the coil’s circuit board to the 5V charging input are all it takes to finish up the hack. I’ll have to agree with the statement that if you pull on a soldering point, there is a high chance that the point will pull the trace away from the pcb. Good idea on gluing the wire next to it. seriously, if the iphone had inductive charging, all other oem’s would follow suit. This may seem offtopic, but Apple is the market leader because it’s being handed to them. Great hack btw, I would like to see more devices go this route (one less proprietary connector). Then the next hack could be “entire desk is inductive charging mat”. Too bad it is only 5v. It be great for my Pandigital Novel, but that uses 12v for power. most of the bigger android tablets are either 9v or 12v. both of my tablets are 5v. Nexus 7 and the HP Touchpad. The touchpad already has built in inductive charging, I wish more things had it. that’s bizarre, I actually bought the parts to do this (different tablet though) just moments before this was first posted. Every tablet I have seen charges with a USB cable, which is 5V.